Bae Magick is a bewitching digital art project that was created by digital interaction artist Carly Whitaker, during her X-temporary residency. She uses fragments of Tinder profiles, WhatsApp emojis, Facebook messages and fortune teller flyers to comment on the digital discourse we have around the absurd and exciting phenomenon of forming relationships online. Our digital interactions produce narratives, cast spells on us, echo and reflect how we behave in reality. A right swipe, a Twitter like or Facebook share can have the same infatuating effects on us as a love potion, while the favouritism we employ towards different emojis reveals much about our psychology. Here, Carly gives us the lowdown on Bae Magick: the inspiration, the process and the role humour plays in her work. 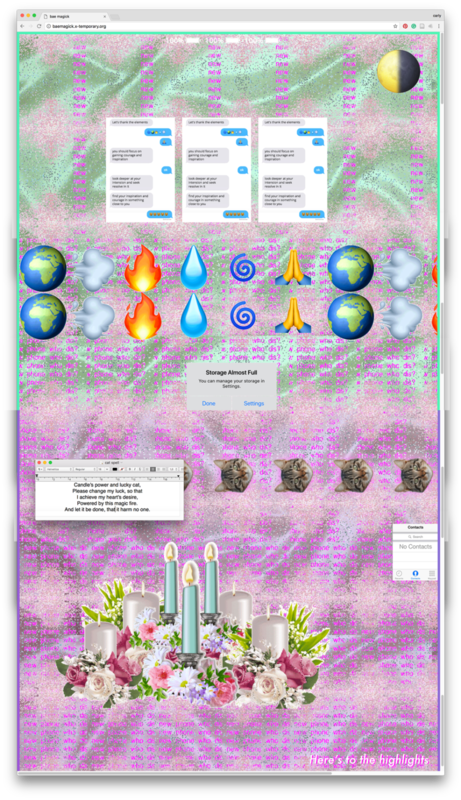 Bae Magick was inspired by a desire to create an alternative world or narrative online around digital discourse that emerges as a result of the way we interact and form relationships online. It’s inspired by my experiences as well as a collective sense of unease, confusion, absurdity and amazement at how we all behave online and the resultant patterns. It was inspired by the way we position ourselves online, the relationships we have with our phone and the archive that develops on it as a result of this. How is digital art spellbinding? There is something magical and mysterious about the digital medium. I love how it can create new narratives, journeys and dialogues around so many different topics. In this specific project, it affords me the ability to create spells which are continuously cast every time someone views the page or reloads it. The reloading and refreshing of the spells give them a new lease or a new energy online – a spirituality – which you can choose to engage with or not. I love how the digital medium (aesthetically and formally) echoes and reflects how we behave in reality and presents us with an energy. This project came about through an online residency platform called X-temporary. Can you tell us about the process? X-temporary is run by Marenka Krasomil, a social scientist and curator, who is based in Berlin. It is “an online residency space for artists and others to propose ideas, develop concepts, open up a process, have fun and more”. Marenka has been very involved in giving feedback and creating a conversation around my ideas in the lead up to starting. Once we agreed on dates that corresponded with the phases of the moon, we emailed back and forth discussing the project outline and sharing thoughts around what I was going to do. Then before starting, I had to organise my concepts and my content; and plan it out from the start based on the phases of the moon.The residency and spells will run until the 26 April. What role does humour play in your work? I’m so glad you found it funny – sometimes I think the jokes are just in my head. The humour that exists in my work often exists in the initial layers of engagement with the work. It acts as a way of accessing both the actual artwork and then reveals a deeper concern or thought at play within the artwork and my broader practice. Humour is also a way that I choose to communicate to my audience. The topics I am dealing with are both hilarious or ludicrous and quite depressing at times. Presenting humour as an initial entry point helps me to access the core of the idea that is embedded in the work and the concepts I am exploring. How has this project built on your previous work? The work builds conceptually, aesthetically and formally on previous work I’ve done. In previous work, I’ve looked at how we form these ‘connections’ online and how we try and make them work through our phones and different apps, et cetera. Being in a relationship requires work and effort. The digital medium makes it easy to form a ‘connection’, but beyond that, it still requires more than a simple message or a swipe. EMOJIKINDALOVE (2016) looks at how we define our emotions and equate different stages of relationships to different emojis. As an aesthetic, they start to reflect our love lives and relationship through their repeated and frequency in text messages. All of the feels for you (2016) looks at the initial stage of falling for someone and how your emotions can build and grow and how expectations change or are challenged when negotiating a new relationship over texts. The algorithmic gaze is central development to my work. I suppose each work acts as an iteration where I try and figure it out and further define it. In selected/deleted/populated/isolated (2016) I look at the digital medium and how we view different perspectives through it and how it changes the way we see things and view other contexts. In Falling Empires (2015) I start a discussion around who owns what territory online and start to question the online information we receive. In what ways can digital art change our perceptions about the creative process and art in general? It is always a challenge as an artist developing a working and successful process. It is something that can be dynamic dependent on the project that’s developing. My process and use of the medium has varied over the years as I’ve learnt more about ‘making art’ and the digital medium. Often incorporating the medium into my work is determined by the concept or aim of the work, but then figuring something out technically and learning how something works triggers the concept. The medium does allow for specific concepts to work more successfully in my practice. However, I think it also does depend on what I am trying to achieve through the artwork. In this way, the medium challenges my creation process and the way I define or contextualise art. How would you describe digital art to someone who thinks the medium is only about gifs and memes? Haha, I love a good gif! Gifs are great, but they’re not all art. Describing art in general, as a broad term is complex and often difficult. As an artist, answering this question can be a good way to contextualise your practice. Digital art uses or incorporates the digital medium somehow. It is an engagement with the technology, beyond just the function that seems to be inherent. I think that digital art starts a conversation in a very specific way that other mediums do not allow for. It creates a contemporary dialogue which the viewer, user, or audience can interact with and contribute to. It is interactive, dynamic and reflective of contemporary concerns both formally and conceptually. Experience the wizardry of the Bae Magick here. Visit Carly’s website to view more of her work. This is great! Love the project. Well done Carly!